This was one of those shows that someone else wanted to go to, but then couldn't attend, so I decided to go anyway. If that's even a thing. It was a sold out show, therefore a popular band, which made finding other people to go even easier. One of the downsides of going with people I've been finding is, I end up talking more to them than enjoying the show. 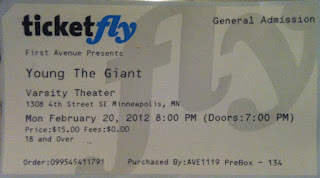 In the case of Young the Giant, it wasn't that big of a deal though, because I wasn't totally in to them. So I didn't feel like I was missing out on anything. Given the show was sold out, the place was packed and getting close to the stage would have been a challenge. But anytime the lead singer did anything, every girl near the stage screamed. It was a bit puzzling since I could see him clearly, but had no idea what the big deal was. I really don't have much to report about this show, since like I said, I wasn't really paying attention. I did enjoy however, standing on the new side minus the stairs. There's a new, larger bar available, which made getting a drink really easy. Almost too easy actually.